A massive rally in support of the Venezuelan president has taken place in Caracas, condemning Donald Trump’s proposal of a “military option” to resolve the country’s issues. Nicolas Maduro announced a nationwide military drill next week to fend off a possible “imperialist” invasion. “I have given the order to the armed forces’ joint chiefs of staff to start preparations for a national civil-military exercise for the integrated armed defense of the Venezuelan nation,” Maduro told supporters who had gathered in the nation’s capital. The drills are scheduled for August 26-27. “Everyone has to join the defense plan, millions of men and women, let’s see how the American imperialists like it,” Maduro added, as thousands of supporters denounced Trump’s threats of possible military intervention. On Monday, thousands of Venezuelans denounced Trump’s statements. 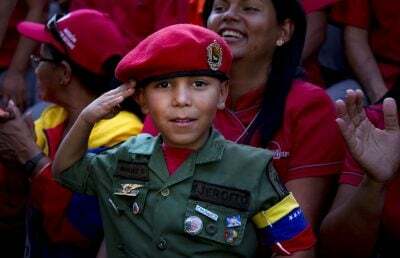 “We will defend our country if at any moment the American empire wants to tread on the sacred soil of Bolivar and Chavez. We are here, ready to fight, ready to defend it with the blood of our patriots if necessary,” said Nelson Rafael Pineda, a military officer at the rally. However, before the US potentially turns to a military option, Washington intends to pursue economic sanctions against the Venezuelan government. “We are absolutely determined to bring the full measure of American economic and diplomatic power to bear until we see democracy restored in Venezuela,” Pence told reporters, as quoted by Reuters. Venezuela has been gripped by violent protests since April, which has already led to over 120 deaths, according to Reuters. Amid the ongoing crisis in the country, the Trump’s administration last month blacklisted a number of senior Venezuelan officials including Maduro himself, freezing their assets in the US and banning American citizens from doing business with them. Featured image is from Medium.